February 10, 2014 – This month marks 10 years since the passing of Booker Noe, the legendary 6th-generation Master Distiller at Jim Beam and the creator of Booker’s Small Batch Bourbon in 1989. The Lexington Herald-Leader reports Beam will release a 25th Anniversary edition of Booker’s using some of the final barrels from Noe’s historic career. “There are some 10-year-old barrels laid down from the last bourbon Dad made before he passed away,” Fred Noe told the Herald-Leader’s Janet Patton. Those barrels will be used for the 25th anniversary edition, with only about 12,000 bottles to be available at a recommended price of around $100. According to Beam, Fred Noe and his son, Freddie, selected those barrels specifically for the 25th Anniversary edition to be left in Booker Noe’s favorite warehouse for extra aging. 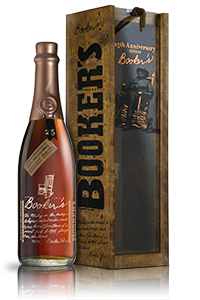 Booker’s normally does not carry an age statement, but the casks used in this batch range from 9 to 11 years old. The batch has been bottled just as Booker Noe demanded it — uncut and unfiltered, with a final strength of 65.4% ABV (130.8 proof). The anniversary edition also comes in a specially designed bottle and wooden presentation box. Editor’s note: This story was edited to include additional information and a photo of the Booker’s bottle.